[Tomato Dirt] Yellow Tomato Leaves: What Do They Mean? Join us on Pinterest! Browse our 40+ boards (and growing) for all kinds of tomato inspiration and practical information: tomatoes just off the vine, staking tomatoes, canning tomatoes, drying tomatoes, tomato problems – even yummy ways to use fresh tomatoes. Check our our page. Happy pinning! Feature: Yellow Tomato Leaves – What Do They Mean? Yellow tomato leaves are a symptom associated with several tomato problems. But yellowed leaves rarely appear alone. Usually, your tomatoes give you another clue to diagnose the problem. Study your plants carefully. Use this checklist to help figure out which situation fits your tomato plant. Over-watering or under-watering. If your season has been especially wet and cool, your tomatoes may be "drowning." Water can clog air pockets in the soil and prevent plants from getting needed air, choking off leaves. Then they yellow. On the other hand, if you're in a heat wave with excessive temperatures, your plants could be over-stressed and under-watered, which could cause them to drop leaves. Make sure plants are getting 1-3 inches of water a week - on the high end of that if it's hot and on the low end if it's cool. Early blight or Septoria leaf spot. Yellowing leaves are a symptom for both diseases. To tell the difference, check to see if there are spots on the leaves. Early blight exhibits dark concentric circles on leaves and stems. Septoria leaf spot presents small dark spots on the lower leaves. 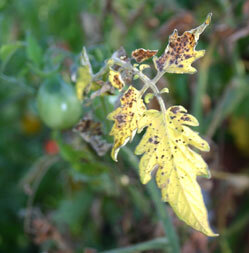 Read more about different kinds of tomato blight and how to tell them apart. Tomato wilts. Fusarium wilt and verticillium wilt also exhibit yellowed leaves. Fusarium often just affects one side of the plant. Verticillium encircles the plant, but the yellowed pattern on leaves is V-shaped. Curly top virus. Infected plants turn yellow and stop growing. Pests. Aphids, whiteflies, flea beetles, tomato hornworm and tobacco hornworm, and psyllids attack tomato plants and leave holes, dew, or chewing injuries to plants -- in addition to yellowed leaves. Check undersides of leaves and along stems for pests! Many tomato problems on leaves are treatable once you identify the source. Use this list of problems on tomato leaves to help you identify your problem specifically. 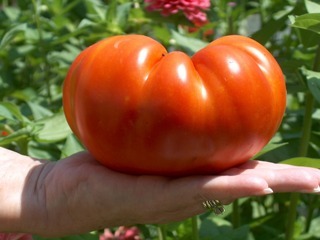 We’re looking for the biggest (by weight) tomato grown in July. The lucky winner will get Tomato Dirt bragging rights … a certificate … and acknowledgement on the Tomato Dirt website. Take a photo of your tomato on a scale, showing its weight. Submit your entry, either by sending us an email or posting your entry on our Facebook page. Enter by midnight on July 31. Even if you think your tomato is not all that big, enter anyway. We’re looking forward to seeing what everyone’s growing! Plus you’ll encourage other gardeners. Read all the details about how to enter here. Many tomato funguses (first diagnosed with yellowing leaves) can be treated organically with a biofungicide like Serenade to lessen symptoms. Follow label instructions. Or apply a fungicide such as chlorothalonil (sold as Fungonil) , Mancozeb fungicide, or Daconil at the first sign of fungus when fruit sets (as a preventative measure) or when conditions indicate a strong potential for it to develop. Follow label directions. Re-apply every 7-10 days or after rain. Are Bumps on Tomato Stems Harmful?